After covering NASCAR for 10 years I have come to the realization that there are some drivers that you feel an almost instant connection with, despite your best efforts to remain impartial. For me, that driver is Trevor Bayne – my first NASCAR interview. Since team owner Jack Roush announced on September 12 that Bayne would not return to drive the No. 6 car in 2019, my memories of that interview in 2009 have been foremost in my mind. And while I’m certain that he probably has no recollection of that day, it was a pivotal moment for me as I began my foray into the world of NASCAR. I remember this particular interview as if it was yesterday. Even though I had spent hours researching and taking notes, I wasn’t prepared for the awkwardness I would feel as I walked into his hauler. And, I didn’t anticipate the various crew members who were also there, especially the ones sprawled on the floor that I had to step across, or the accompanying noise level that I feared would be distracting. Bayne, however, was anything but awkward. He quickly put me at ease with his thoughtful and articulate answers and I soon forgot my surroundings. I was impressed with this 18-year-old although, at the time, I didn’t realize that he had set such a high bar. I would soon learn that not all interviews would go as smoothly and that some drivers would not be as well-spoken or as open. But Bayne’s interview instilled in me a confidence that I would carry with me moving forward. During his career, Bayne has experienced the highs and lows of a sport that can be rewarding one moment and devastating the next. He went from being part of the Dale Earnhardt Inc. driver development program in 2008 to find himself out of a ride due to lack of funding the following year. Bayne, however, used that disappointment to fuel his desire and propel him to the next level. A meeting with Gary Bechtel (former owner of Diamond Ridge Motorsports) led to a racing deal in the Xfinity Series with Michael Waltrip Racing on a part-time schedule in 2009 that continued through September 2010. Bayne also relied on his faith during the difficult times. 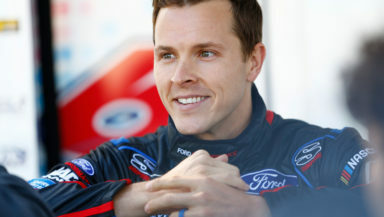 The next stage of his journey came in October 2010 after forming an alliance to compete for Roush Fenway Racing in the Xfinity Series and his debut Cup Series race with Wood Brothers Racing at Texas Motor Speedway on Nov. 7, 2010. Bayne remained with Wood Brothers Racing on a limited schedule through 2014. And who could forget his astonishing Daytona 500 win in 2011? He scored the victory in only his second Cup Series start and became the youngest driver to win NASCAR’s premier event. It was the highlight of his career. This memory is as vivid for me as that first interview, but not for the reasons you might think. A few weeks earlier I had lost my brother in a tragic accident and I was struggling to find my way out of the fog of grief that had enveloped me. NASCAR was the last thing on my mind. But old habits die hard and I found myself in front of the television watching the race. As I watched the final laps of the race unfold, I couldn’t believe this 20-year-old kid might actually win. When he crossed the finish line and I heard him scream, “Are you kidding me?” I remember laughing out loud. It was exhilarating to see how far he had come since that 2009 interview. Bayne’s Daytona 500 win came one day after his 20th birthday on February 19, ironically a birth date he shared with my brother. For the first time in weeks, I had completely forgotten everything else and was lost in that moment. And even though the excitement soon faded, for those few minutes, I had forgotten my sorrow and had taken the first small step in beginning to heal. As Bayne celebrated that day, little did he know that he would face his own challenges as unexpected health issues took center stage. Bayne began experiencing various symptoms including fatigue, nausea and blurred vision. Although he underwent extensive tests, doctors were unable to determine the cause of his illness. As a result, he competed in only a partial schedule that year. Although he didn’t experience any more symptoms, Bayne continued to search for an explanation and finally, in June 2013, his doctors confirmed a diagnosis of multiple sclerosis. In 2015 he began competing for Roush Fenway Racing full-time in the Monster Energy NASCAR Cup Series with a partial schedule split with Matt Kenseth in 2018. In 187 Cup Series starts, he has one win, five top fives and 16 top 10s. His last race for RFR was at Texas Motor Speedway where his Cup career had begun in 2010. Bayne described the experience on Instagram. Whatever the future holds, Bayne will undoubtedly embrace it with the same conviction and heart that has exemplified his life and career. And, hopefully, destiny will intervene and our paths will cross once again. Xfinity maybe? Some folks want to see him in the 9. Or he might want to do some Trucks? He’s never had a Truck season before. I’d love to see him stay in the Cup Series but don’t know if that’s a possibility at this point. Xfinity would be a good second choice. I just wanted you to know that I really enjoyed your piece about Trevor Bayne. Thank you for writing what you did, and I really appreciated your personal connections to the subject matter. I am a long time fan and I too will never forget Trevor Bayne winning that race with the Wood Brothers. I remember screaming out at a party, “The Kid Shocked the World! The Wood Brothers just won the Daytona 500!” Keep up the great work and thank you again for your touching and personal tribute to Bayne. Happy Thanksgiving! Thanks so much, I’m glad you enjoyed it. I appreciate the kind words and I hope you have a Happy Thanksgiving too. Great article. Here’s hoping that we haven’t seen the last of Bayne (and in better equipment than Roush Fenway saddled him with). Thank you, I’m hoping he’ll be back too. Sometimes change is good.